Marco Wittmann celebrated his second win of the year at the third race of the DTM season in Budapest. The BMW Team RMG driver took full advantage of his pole position in the Ice-Watch BMW M4 DTM to comfortably lead the race from start to finish. June 01, 2014 - After 41 laps of the Hungaroring, Wittmann came home 6.615 seconds ahead of Miguel Molina (Audi). The 24-year-old has regained the lead in the Drivers’ Championship with 50 points ahead of his home race at the Norisring at the end of June. The victory was BMW Motorsport’s 61st in the history of the DTM, and the second with the new BMW M4 DTM. 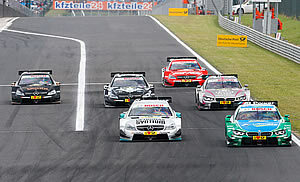 This was also the second win in the DTM for BMW Team RMG and its boss Stefan Reinhold. Bruno Spengler produced a successful fightback in the BMW Bank M4 DTM to cross the finish line in third place and claim his first podium of the season. Spengler had started the race from ninth on the grid and on standard tyres, and could initially do nothing to stop all the cars on the faster option tyres from passing him. However, when the 2012 DTM champion had changed onto the softer compound, he promptly set about charging through the field on his way to third place and a richly-deserved spot on the podium. The two DTM rookies in the squad of BMW Motorsport drivers scored their first points of the season: like Spengler, Maxime Martin fought back impressively to finish sixth in the SAMSUNG BMW M4 DTM. António Félix da Costa came home eighth in the Red Bull BMW M4 DTM. Timo Glock, his team-mate at BMW Team MTEK, suffered a disappointing end after what had been an impressive display at the Hungaroring. Starting from second on the grid, the DEUTSCHE POST BMW M4 DTM was on course for a podium finish for long periods of the race. However, a combination of the harder compound and some overly-aggressive driving from his opponents resulted in Glock losing ground over the final laps. A puncture suffered as a result of a collision meant he eventually had to settle for 19th. Augusto Farfus struggled with technical problems on this Castrol EDGE BMW M4 DTM from the word go, and retired from the race with ten laps remaining. Martin Tomczyk (BMW M Performance Parts M4 DTM) and Joey Hand (Crowne Plaza Hotels BMW M4 DTM) finished 13th and 15th.